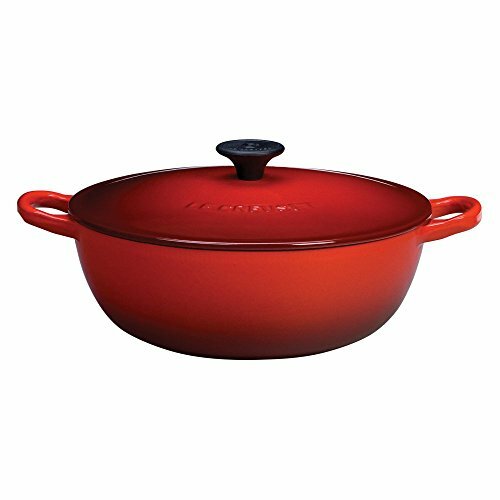 When your crowd demands large portions and lots of 'em, it might be time to pull the Le Creuset L2574-322 7.5 qt. Bouillabaisse - Flame out of your cupboard and start cooking. 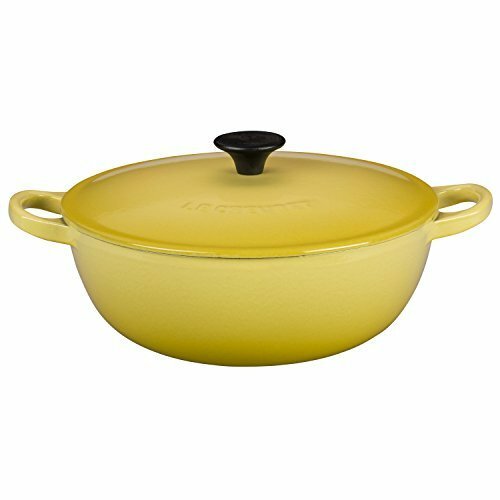 This oversized pot is not only good for preparing bouillabaisse, but can also be used for other soups, stews, and casseroles. It's oven-safe to 450 degrees F, and the handy carrying loops make it easy to carry from stove to table, where you can show off your handiwork. Hefty enameled cast iron is a traditional favorite with amateur and professional cooks everywhere because the qualities of cast iron make it easy to cook foods right every time. This pot has a wide mouth and a small bottom, with sloped sides. That means it can accommodate large quantities, and you can use it on any average stove. The lid seals tight and captures heat within the pan, on the stovetop, or in the oven, so natural flavors blend deliciously. The enamel surface resists wear, and cleanup is simple. The smooth sand-colored interior releases food easily, and no soaking or scrubbing is required. Not only that, but the bright color of Le Creuset enameled cast iron cookware adds joy to your kitchen, as well. You'll be plenty prepared to feed armies of hungry people when you have the Le Creuset bouillabaisse.